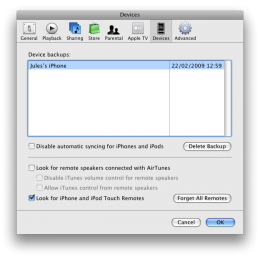 Where does iTunes keep its iPhone backups? Whenever an iPhone is synchronised with iTunes, iTunes makes a backup of (most of) the iPhone’s data. You can view the iTunes’ backup history by going to Preferences > Devices. 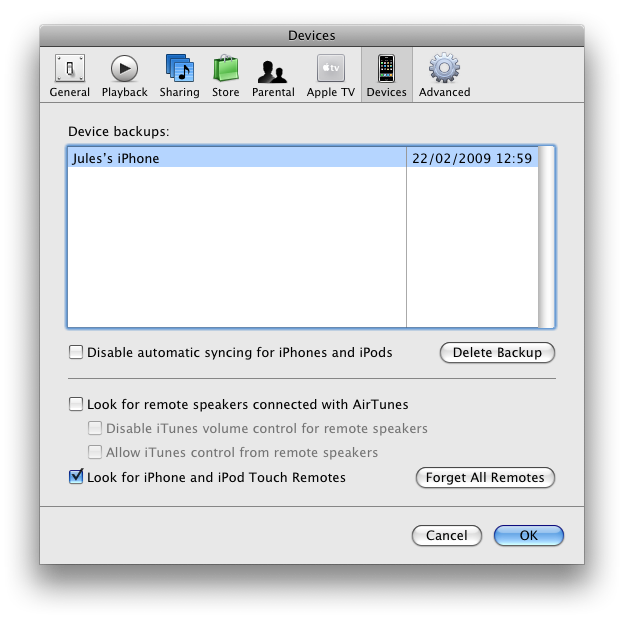 iTunes maintains some kind of history for successive backups, but I have no idea of the underlying logic. You would imagine that three or four backups would be queued and older backups retired as new ones are made. But no, that doesn’t happen. Instead iTunes seems to purge its backup history on a schedule of its own devising — I’m guessing maybe daily, but I haven’t yet bothered to try and find out. iTunes 7 has a Preferences option to turn of the Genre column in the main window, iTunes 8 does not. This is very frustrating. I’m not in the least bit interested in seeing what genres are in my music library, and the Genre pane takes space away from the far more useful Artists and Albums pane.